House, 4 Bedrooms, 1 Bath, Sleeps 8, Must provide own bedding. This water view, beach access home is located just one house away from the beach. The house features four bedrooms, one full bath and one outdoor shower. Bountiful fine white sand beaches are just a few steps down your own private path to the beach. This beach access home is located on Toms Road in a very private section of Plum Bank Beach within Old Saybrook. Plum Bank is a strip of fine white sand bordered on one side by Long Island Sound and on the other side by acres of salt marshes. Safe swimming conditions for children because of small waves, no undertow, and no fast drop off. Low tide reveals hundreds of yards of clean sandbars and shallow tidal pools which are a great place for kids to play safely and for long walks. Striped Bass are readily caught by surf casting from the beach in front of these homes. Walk on your private path to the beach about 75' away. This house is adjacent to a vacant lot owned by the same owner. The vacant lot abuts the salt marsh tidal waterway. The vacant lot has a private boat launch ramp that may be used at your own risk to launch a lightweight shallow draft boat. The vacant lot may also be used for additional parking. Secluded and private surrounded by expansive water views to the East and to the West. The acres of clean firm sandbars that appear at low tide provide an amazing and safe playground for kids. It is "the best beach in the world" for kids! What is also unique is that we have three large maple trees that provide wonderful shade which is unique for a property so close to the beach. The convenience of a private boat launch is also a unique feature of this property. Saybrook and nearby Essex have walkable "downtown" areas with many shops. Private right of way path to the beach and right of way to use the private beach. Long Island sound can be seen to the West and salt marsh tidal waterways can be seen to the East. For storage only. Washer and dryer location. 9-hole course in Fenwick. Mini-golf nearby. Four bedrooms 1. King w/ AC unit in window, 2. Full, 3. Futon, 4. two twin beds. Large great room with three new extra large leather couches, tv/cable, DVD player and WiFi. Kitchen with coffee maker, toaster, microwave, basic cooking utensils, dishes. Deck for dining and relaxing overlooking marshes. Washer & dryer in garage. Outdoor grill, outdoor shower. This house is adjacent to a vacant lot with the same owner. 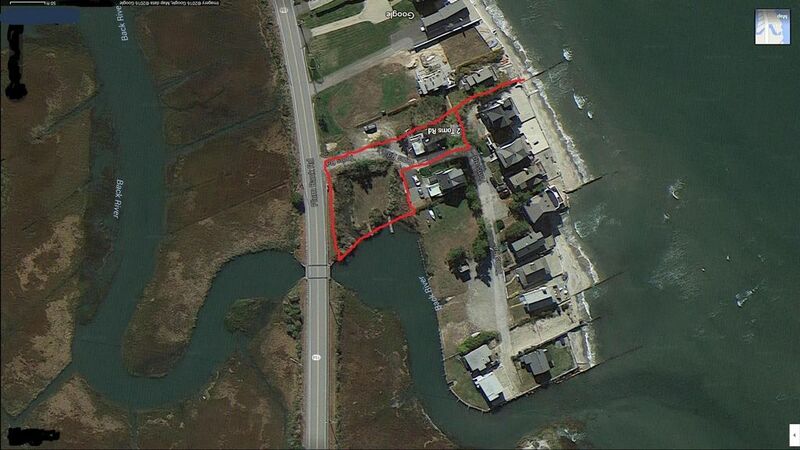 The vacant lot abuts the salt marsh tidal waterway. The vacant lot has a private boat launch ramp that may be used to launch a lightweight shallow draft boat. The vacant lot may also be used for additional parking. The house has great water views and backs up to the marsh with docks for crabbing and fishing. Great spot for the kids! Front porch is an ideal spot for coffee in the morning while enjoying the view. Because the week was so warm & humid, house became a bit uncomfortable. Front deck was nice! Place was not exactly clean though & lacked some basic necessities like toilet paper, soap, paper towels & a working fan for the living room. So glad you provided the Pack & Play for the baby. perfect destination for a hideaway. A shady spot on the beach, how rare and wonderful. Great house for a runaway week or weekend. Cool shady spot, yet right on the beach. Comfortable beds and plenty of room. Sunsets just a stroll away. Couldn't have been happier with our weekend getaway. Private and quiet, everything anyone could want. Loved it! Sunbathing, fishing, beach combing, very kid friendly with tidal pools. Many dining and shopping activites are a short drive away. Outlet stores in nearby Clinton and Westbrook.Mini-golf and ice cream shops nearby. The Connecticut River Museum and the Essex Steam Train & Riverboat Ride just a few miles away in Essex (Valley Railroad). The Mystic Aquarium is 20 minutes away in Mystic. Lake Compounce amusement park in Bristol is also home to Connecticut's largest water park.Gillette Castle State Park is a 30-minute drive. Weekly Rate: $2,100 plus cleaning fee Summer rate: $2,100 per week plus cleaning fee. (Saturday to Saturday rental.) Academic rental available $1,000 per month (+ utilities) October through May. First and last month's rent up front with 3-month minimum and $300 security deposit.